I am pleased and delighted to join law professors Alan Meisel and Kathy Cerminara as a co-author on the Right to Die: The Law of End-of-Life Decisionmaking. This 1400-page legal treatise from Wolters-Kluwer is THE authoritative legal reference source on issues relating to end-of-life medical treatment. 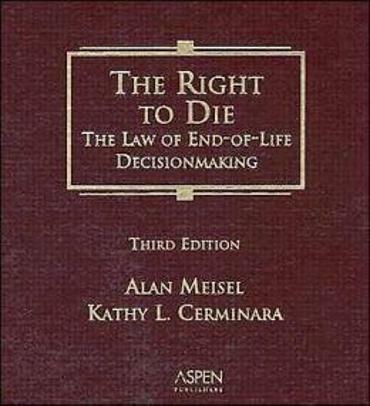 The first edition of The Right to Die was published in 1989. The second edition was published in 1995. The third edition was published in 2004. It is updated annually. The 2016 supplement was issued in December 2015. Ask your library to order a copy today. The Right to Die, Third Edition analyzes the statutory and case law surrounding the profound issues of end-of-life decisionmaking. Whether the situation calls for long-term planning or quick, unexpected decisionmaking, this cogent, one source treatise guides you through all the available channels for helping your clients reach the ultimate resolution.